If you’re a fan of Belgian waffles, don’t go out for breakfast anymore. Forget about those frozen bricks of batter. But when I think of making waffles, I remember my mother making waffles in her old waffle iron and the mess and bother it created. As a result, we didn’t have them that often. Now, in a matter of minutes you can mix up the batter and bake a delicious waffle in your own kitchen. Crispy on the outside and fluffy on the outside, these fresh, hot waffles will make your mouth water in delightful anticipation. Presto has been producing small kitchen appliances for years, and has earned much respect in the industry for the quality of its products. This little waffle maker lives up that that reputation and ranks among the best waffle makers. Designed for ease of use and nonstick clean-up, this waffle maker nevertheless boasts professional styling and restaurant grade design. The extra-thick grids have deep pockets for lots of great toppings. The grids produce a waffle measuring about 7 inches in diameter and about 1-inch thick with four easily discernible quarters that make the waffle easy to cut. The base permits the waffle maker to flip upside down to assure even distribution of the batter and allows for easy, space-saving vertical storage. A timer in the base lets you set the desired cooking time, usually between 3 and 4 minutes. When the waffle still needs a minute to bake, the timer will beep to let you know. From then, the indicator screen will count down the seconds until the waffle is done. At that point, it will beep several times. This product was created for the person who loves waffles and loves to make them with little muss or fuss. The batter is easy to make and the waffle iron itself is easy to use. The beginner will love its simplicity and the more experienced cook will appreciate the restaurant quality of this product. Inside the box you will find the waffle maker and a user manual which includes the waffle maker and an instruction manual that includes complete directions, recipes, and trouble-shooting tips. This waffle maker has a unique set of features. One great feature is the 180° rotation of the iron itself. You put the batter on the lower grid, shut the lid, and then turn it upside down. This assures even distribution of the batter. Another feature is the timer. Some models have only an indicator light and your own watchfulness to determine when the waffle is done. This one will let you set the cooking time and then will sound a series of low beeps when the time is up. The ceramic nonstick grids, however, are not removable for cleaning as in some other models. But, in all fairness, the manufacturer claims all you need to do is wipe it clean with a soft cloth. Another feature is the storage function. Press a little button in the base, flip the iron up to the vertical position and snap it in place for storage at the back of your counter or in a cabinet. It takes up very little space this way. 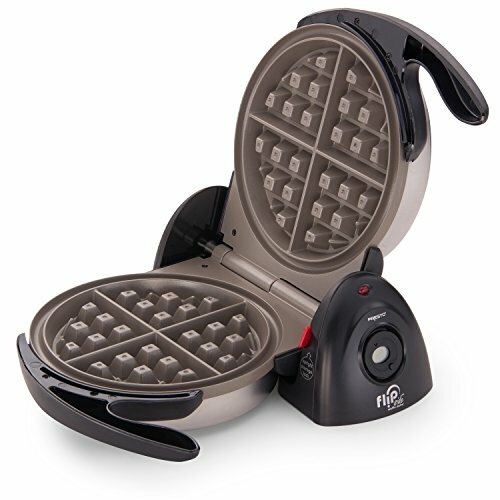 The Presto Ceramic FlipSide Belgian Waffle Maker is easy to use. Simply mix up your favorite batter. Plug in the waffle maker and turn it on. When the indicator light tells you the appliance has heated up, pour in your batter and close the lid. Turn it upside down. Set the timer and wait for the minutes to click by. When you hear the beeps that indicates your waffle is done, open the lid and remove a delicious waffle. For a complete tutorial and demonstration of this waffle maker, check out the video below. But I warn you, you’ll want to start making delicious waffles. The biggest downside to this waffle maker is that you cannot remove the grids for cleaning. However, the manufacturer says you don’t have to. They have faith that all the non-stick ceramic coating will do its job. So if you’re a person who really needs to get things soapy in the sink, this waffle maker may not work for you. If you really must have removable plates, the Hamilton Beach Flip Belgian Waffle Maker is a comparable product at a comparable price. It flips and stores in the vertical position like the Presto product. But, its nonstick grids are removable. From all I can see, the Presto Ceramic FlipSide Belgian Waffle Maker is a winner. The flipping feature helps to evenly distribute the batter and allows for vertical storage. The timer allows you to bake waffles to your particular desired doneness without watching the clock. And the nonstick ceramic grids make for easy cleanup. Truly, this waffle maker allows you to produce a great waffle without all the bother that used to be inherent in the operation. With this little beauty, I wonder what mom would think. Never mind. I know. We’d probably have them every morning.